Gurugram: The Supreme Court slapped a fine of Rs 70 lakh each on two doctors, holding them guilty of allowing a former Haryana legislator Balbir Singh, against whom non- bailable warrants had been issued in a murder case, to remain in the hospital for 527 days without any justifiable reason. A bench, comprising Justices Dipak Misra, A M Khanwilkar and M M Shantanagoudar, refused the contention of petitioner to cancel the licence of the Gurugram-based private hospital but agreed to impose a cost of Rs 1.40 crore on the two doctors. It asked the doctors to deposit the amount with the apex court registry within two months. The court had said the two doctors were responsible for “such prolonged admission” of former INLD MLA Balbir Singh, against whom repeated non-bailable warrants were issued by the courts in connection with a murder case. The hospitals Medical Director Dr. Munish Prabhakar and Managing Director Dr. K S Sachdev were held guilty of contempt by the Supreme Court which had said they had “obstructed” in the administration of justice. The apex courts order had come on a plea filed by Sita Ram, who was the informant in the FIR lodged in May 2011 in Rohtak district of Haryana, in which he had sought initiation of contempt of court against Balbir for “willful and deliberate violation” of apex courts October 24, 2013 order. The apex court had then set aside the order passed by the Punjab and Haryana High Court granting bail to Balbir and directed him to surrender forthwith. However, he did not surrender after the apex court order, following which a trial court had issued non-bailable warrants against him. When the court was informed that Balbir was hospitalised, it had asked the police to verify it and during the enquiry, it was found that he was admitted in the hospital for 527 days. During the adjudication of the matter, both the doctors had told the court that they were not aware that there was any direction to Balbir to surrender to custody. 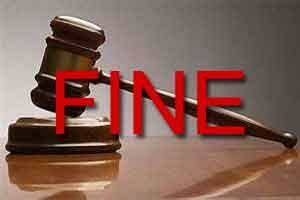 Why only fine, not a term for obstructing the implementation of legal orders? such deliberate defiance of legal orders need to be curbed with more severity. If true then they have got their just desserts.